Magnet Man's stage map and music. Mag Fly guards the first section of this stage. It pulls Mega Man up to a set height if he's standing under it, and the player can move left and right to escape or move up and down slowly. These are normally all moving to the left, and the sudden change in movement can be dangerous with those pits scattered around. However, passing a spawn point for one of them and walking back to it causes it to move to the right, allowing you to ride it all the way across. As soon as we climb down, Proto Man warps in and begins attacking us without explanation. His only action in this fight is to jump and shoot two bullets in the air, meaning he won't hit us on the ground except through collision. He also won't turn to face us, so getting behind him and following his movements while shooting will take him down fast. Once he leaves, a section of the floor explodes, allowing us to continue. The next few screens introduce Giant Springer. He slowly moves forward while firing missiles and flips out if we get near it. As big enemies that act as damage soaks go, this is a pretty good one, as it only takes eight hits but the missiles can distract the player from gunning it down too quickly. There are two of those in this room, after which we meet Peterchy, who simply moves forward slowly and takes three hits. There's a couple more screens with Peterchy as well as a magnetic device that pulls Mega Man forward as he gets close, followed by a health reward for players who take the next ladder slowly. The following segment is the obligatory vanishing block puzzle for this game, and I think it's handled pretty well here. The first two are done in safety, while the last two include magnets with pits under them, and a pattern that tries to trick the player into jumping within their range but doesn't force it. Also, the puzzles take place in a small enough area that the player can study everything but the very last block (which is easy) without committing to anything. I think it falls too far on the easy side, but the whole stage is pretty much a breeze. All that's left here is a New Shotman, who fires in groups of three to the sides while continuously firing arcing shots from the top. He only takes three hits, but his positioning makes it feel like a tougher fight. There's a reward for players who don't mind climbing back up to fight him again, and one last Giant Springer before the boss. There's not much going on in this one, and along with the fact that Magnet Man himself is weak to Mega Man's Buster, it's obvious that this was intended as an easy stage to start with. 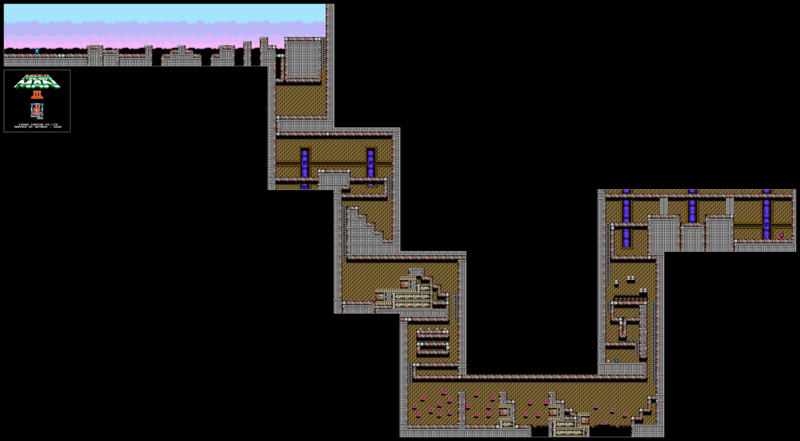 It's not bad for that purpose, and Proto Man's appearance and the vanishing blocks help flesh out an otherwise simple and short stage. The music is, of course, another favorite, and though the visuals are fairly average, we do get the batteries with the "RW" logo as an interesting Easter egg.